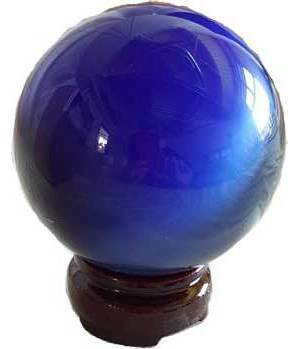 Cat's eye crystal ball. They are made from "spun glass" a concentration of glass fibers melted together. Each has an aura inside that when turned can seem like an eye or internal halo. Some say setting it upon a pillow or at nearby that evil is kept at bay and can not enter. Each is unique and can be used as display, scrying or decor.